I arrived at Horton Kingsmead 1 late one Friday afternoon, with the memorial of the late Del Smith that Saturday the lake was packed with people travelling down to attend. With not many pegs available I opted to slip into a peg that had produced for me during a prior trip, it’s a peg that is fortunately in the carp park meaning I could leave the majority of the kit in the van ready for a move the next day when the lake freed up a bit. With confidence low of a bite I decided to get my head down early, get up at first light and assess my options while the fish would be at their most active. Sadly shows were at a minimum and made it difficult to find them from my chosen peg, so I wound in and opted to go for a walk. I had taken pictures of a couple captured by the angler next door, his water commanded more towards the back of the wind giving a good clue of where to look first. I crossed the bridge dividing the island and Kingsmead 1 lakes to look in a peg called “the Bream” just on the other side. I sat for around 20 minutes watching a few areas of fizzing before nipping next door to speak to one of the bailiffs stalking in the next peg, with the bream so active I was unsure if they were the culprits instead of the sought after carp. 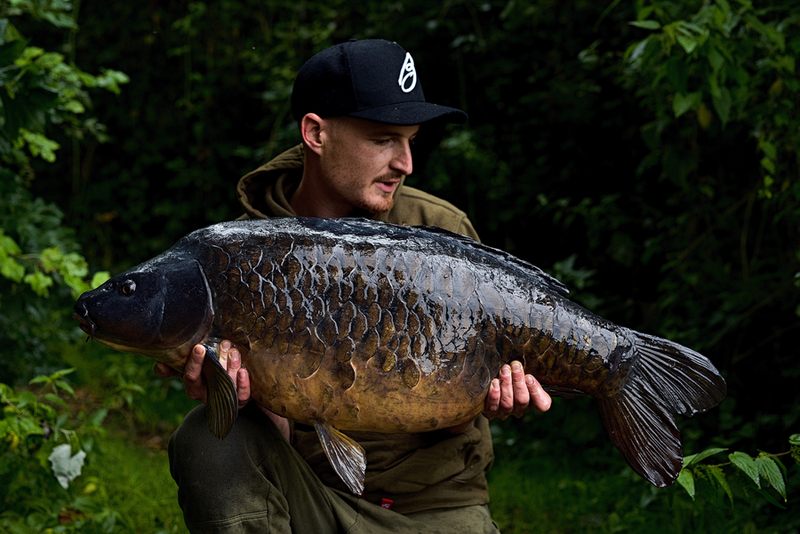 Within a couple of minutes of talking the bailiff had a take confirming the carp were certainly in the area. 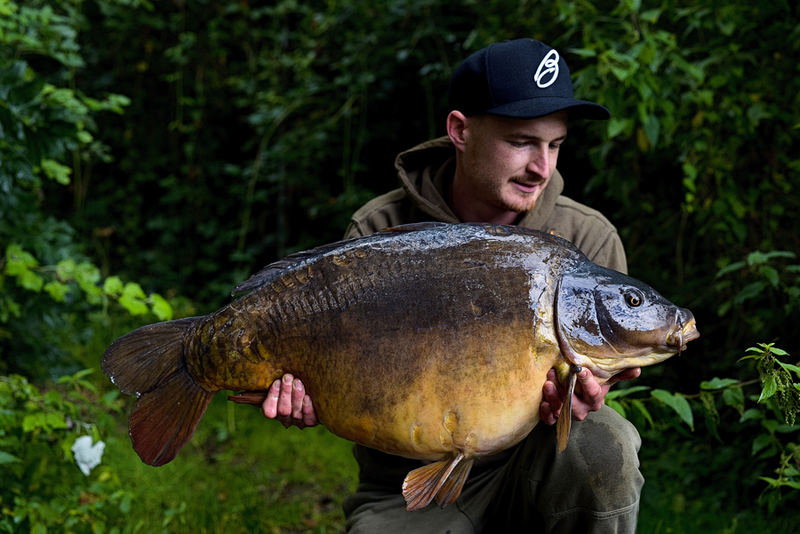 I wasted no time running back to pack down and get moving, whilst crossing back over the bridge with the kit I spotted two chunks right beneath stirring the margins up before plodding towards the left hand snags of the Bream swim. 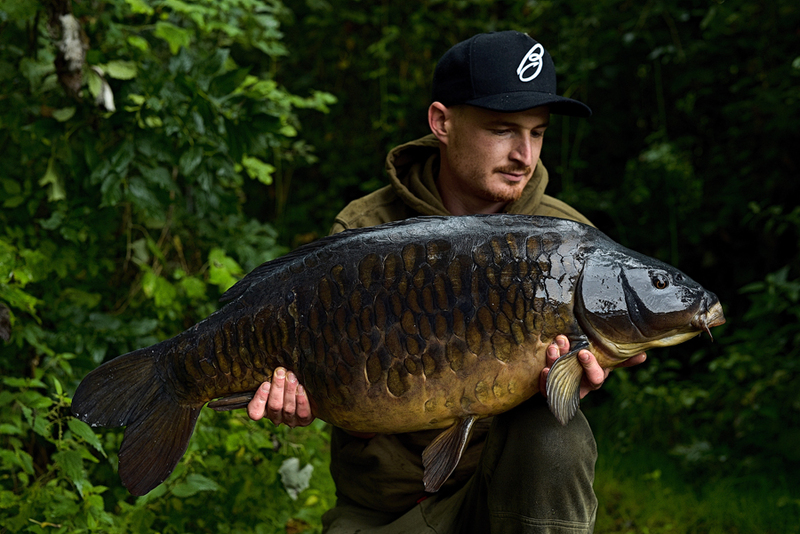 With my confidence of a quick bite rising by the minute a rod was quickly positioned just off the corner of the snag line leading towards the dividing bridge, a Fluorocarbon D rig mounted with a balanced wafting 15mm Monster Tigernut pop-up on the end. With one rod sorted and hand full of matching offerings spread around the area I flicked a lead out a couple of times only to plum into thick weed. The fish were in the area and I certainly didn’t want to ruin my chances of a bite so I gave up on the second rod for now knowing I had all afternoon to see signs of feeding fish hopefully pointing a spot out to me. The peg is limited to 10 wraps so options were low and any time spent leading around could just push the fish away. I set up camp and just sat watching the lake, after roughly an hour and half after chucking the rod out I noticed some ripples coming out of the shallow left hand snag line slowly creeping towards the spot, a few minutes later the bobbing rose slightly and the line started to pick up tight. After lifting into the rod the fish decided to head straight towards me, frantically trying to keep up with it I was sure it was a bream doing the typical surrender turning side to side not knowing what to do. The line finally tightened again and the fish swirled on the surface just a few yards out, I didn’t get a good view of what was on the end but a jet black tail flicked over confirming it was actually a carp on the end. After just one small charge I slipped the net under one that really knocked me back, a dark heavily scaled mirror which could well of been one I was told about just that morning. She was quickly unhooked and slipped in the retainer whilst a quick phone call was made to none other than the camera magician himself Rupert Whiteman, he was just about to picture the unveiling of Del’s memorial piece giving me time to reposition the rod and get everything ready for his arrival. Shortly after the heavens really opened up for a forecast heavy shower, I knew there were still a couple in the area and hoped the rain spurred them on for another feed. Just as the thought crossed my mind I received a savage liner, that much so I nearly hit into before the line slackened back down. Sitting on my hands the rain stopped and Rupert confirmed he was on his way, after arriving sweltering in his winter suit he asked for a moment to take his jacket off and cool down, it suited me as I was sure the rod was about to go. Just as I told Ru of my liner and certainty of another the bobbin rose, line picked up tight and pulled out the clip. The fish was exactly the same charging towards the reed bed lining the front of my peg, the trouble is the rod tip passes the reed fringe and leaves the fish confused what to do next, with Ru on hand with the netting it wasn’t long before a thick shouldered Sutton was in the net, hows that for timing saving Ru another long walk from the Horton lodge. 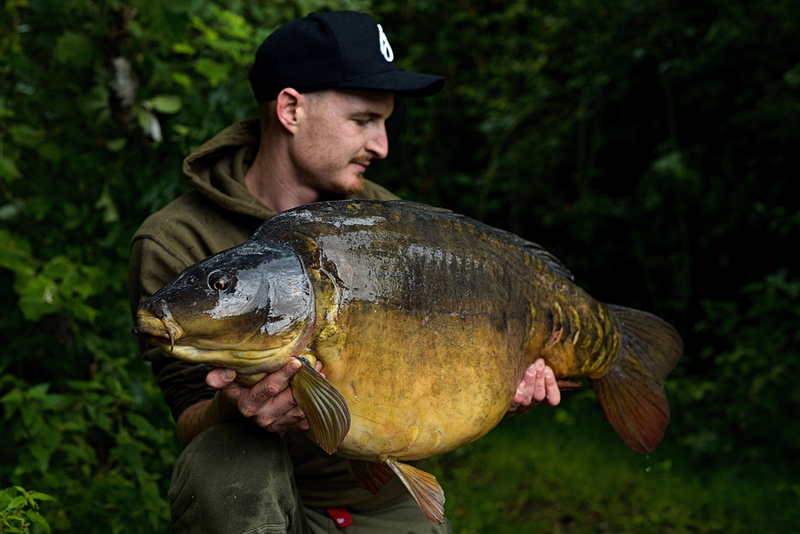 We opted to weigh and picture the Sutton strain mirror first and coming in at 37lb 8oz and couldn’t believe my luck what a brace with what could be the prettiest carp to ever grace my net. 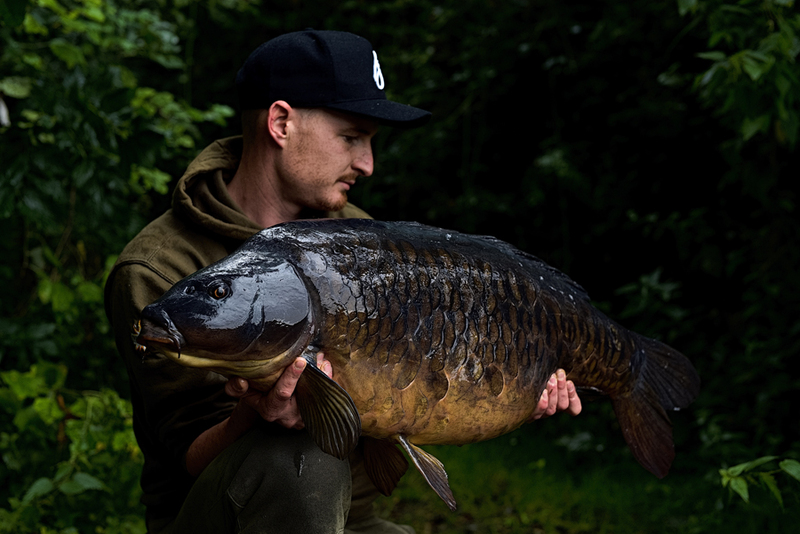 We slipped her back and got ready for the heavily scaled mirror, after lifting her onto the mat it was confirmed as one of the lakes A-team quite simply called ‘The One’ a jet black fully scaled mirror and what a suited name it is. At 33lb 10oz Ru confirmed it was the largest weight to have been captured but that didn’t matter, this really is a once in a life time fish and to brace it with my Sutton fish I certainly felt overwhelmed, filled with joy and excitement. Nothing else prevailed for the remainder of the trip as they moved out a short while after, I opted to not move for the final night and just take it all in and enjoy looking at the fantastic pictures Ru had taken. Many thanks to Rupert once again for taking time out of his day to lend his helping hand.